Doire Colomcille and Michael McCallion have been enjoying their best league season in years. Struggling Ardmore who are still playing catch-up with their games. On Wednesday night they entertained Glack at home but it was another defeat for St Mary’s as the O’Connor’s claimed a 1-11 to 1-07 win in a game in which both teams were still trying to get their season on track. Ardmore’s form has slipped back badly in the last two years and it will take lot of work to make them a serious force again but players moving to other areas for work reasons has been a cause for worry. If Glack was difficult then this trip to Limavady on Sunday is nearly impossible on current form. The Wolfhounds defeated leaders Drum last week, the first team to do so this season and now sit level on points with Drum. The leaders have a game in hand but to stay in contention the Wolfhounds must win all their games and it is difficult to see Ardmore stopping them from keeping the pressure on. Magilligan will be fancied to take both points from a Dolans team that do not have many wins away from home. The Creggan men have improved a lot since the start of the season and will not be found wanting but few teams take points away from Magilligan. They have a strong and settled team with Ciaran O’Hara a strong force at midfield and Conor Canning accurate in attack. They have made a big improvement in attack where they are now more potent than they have been in a long time. Dolans have some very experienced men in their ranks and won’t make things easy but they are inconsistent. Alan Grant, better known as a hurler, is also an excellent footballer for the Dolans and can control the middle third but the city men do not always take the scores they should. Magilligan’s team play should see them win. Magherafelt Thirds caused a huge ripple in the third division pool when they defeated Glack in the first of their two league meetings. This time they travel to Brolly Park and while it will be difficult for them to repeat the dose it must be noted that they ran Magilligan to just two points in their last game. In that round Glack lost to Limavady at rain lashed Scroggy Road but it took two late Limavady goals to put a shine on the Wolfhounds hard fought 2-8 to 0-3 victory. Inconsistency has hit Glack hard this season and stopped them from ever looking like challengers. They did get back to wining ways against Ardmore on Wednesday night with a 1-11 to 1-07 win but they still uncharacteristically low in 7th position. Magherafelt have rarely won away from Rossa Park and this looks like revenge for Aaron O’Connor’s team. After losing to Limavady in what was their first league defeat of the season, leaders Drum have left themselves with little room for error now in the title race. And it is unlikely they will have things their own way at Drumullan given that Ogra ran them to just a goal in the first round at Drum. Since then Ogra have probably slipped back and are now out of the promotion race. Drum’s fitness has been a big factor as they move closer to intermediate football in 2017. They have a good strong panel of players and have half a dozen of them capable of taking scores but can they keep thier composure with Limavady now scenting ‘blood’. Ogra, working with a smaller panel, will not have some of the luxuries that their visitors have. Still with the high scoring and experienced Stephen Devlin back in attack so they are well capable of giving Drum a big test. 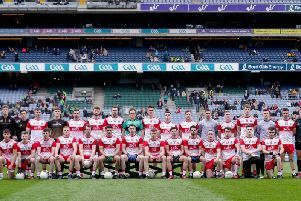 Having won away against Slaughtneil, the ever improving Doire Colmcille should complete the league double this weekend as their confidence increases game by game. Led by Dean Curran and Dee Watson, the Colmcilles are having their best season in years and now sit in mid table with 11 points from five wins and a draw. The opening of their magnificent new playing field and club house has given them more purpose and the players are responding on the pitch. Curran remains the focal point of the attack but the increasing support he’s getting bodes well for the future. The city men have a mix of youth and experience but with players coming through they are eyeing their best finish in years. Slaughtneil Thirds are out to enjoy their football but they look set to finish second in what could be a high scoring game.